The camera is found on the right IP adress. I set creditentials, but after I have an error “Connection failed”. When you have this connection failed go back to camera config. and tab Custom URL. Switch between rtsp_tcp and rtsp_udp. That usually helps. Try also to use a PTZ profile since the camera is PTZ. Thank you for your answer, I switched between rtsp_tcp and rtsp_udp but nothing change. Is it normal this message error "Sender not Authorized ? well well. This was a new one. Usually in the Address field you get an URL like rtsp://xxxxxx and the red screen, but here you just get this “Sender not Authorized” message? I assumed that you used a rtsp profile? If jpeg selected stream type must be jpeg. But, stay with rtsp. 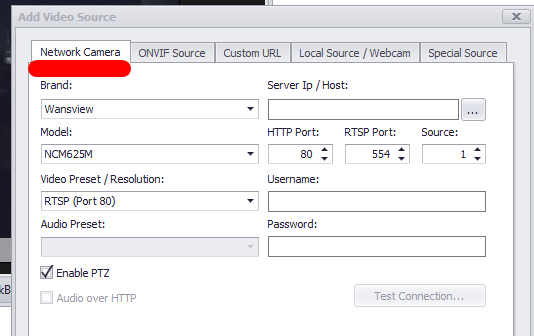 1.some cameras have a more advance security for the rtsp login. Login to the camera configuration. Find something about rtsp login. Usually it is called Basic and “higher level” or something like that. Use Basic. Test again. 2.I have a couple of cameras with a bug in the firmware. When I change login from default to custom I can use the customized username/password to login to the camera. But, when I use the rtsp://xxxxxxx I must use the default username and password. So go back to the default logins and use that for the ONVIF process. Yes I have just this error message and “connection failed” when I close the config window. I Can’t choose an option like this in Wansview iOS App, I can just add users (administrator, operator, spectator), I used Administrator. I reset the camera, I used default login / password… doesn’t work. I still have “Sender not Authorized”. When adding the camera go to tab for Custom URL. This will only give you video and audio. However, if you also want PZT I suggest the following for test. Save this. No you get this red screen. Go back to the tab for Custom URL. Now you should have this Sender not Authorized. Save this. Now it is interesting what you get. With the custom URL 'rtsp://username:password@192.168.1.182:554/live/ch0), it’s working ! The PTZ seems not work (I click on arrows but nothing happens), but thank you again.